WASHINGTON — President Donald Trump, who spent his first full day in office berating the media over their coverage of his inauguration, will spend Sunday engaged in more routine matters, like overseeing the swearing in of high-level staffers. On the second full day of his administration, Trump will see the “assistants to the president” sworn in, according to his press secretary, Sean Spicer. He’ll also hold a reception for law enforcement officers and first responders who helped with his inauguration as he celebrates his 12th wedding anniversary. White House staff are scheduled to have a briefing on ethics and another on the proper use and handling of classified information as they begin to make themselves comfortable in their new White House offices. While Trump has said that he’ll consider Monday his first real day in office, he is already making clear that sparring with the press will be a defining aspect of his administration. 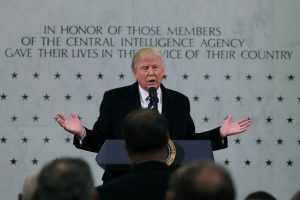 Trump turned a bridge-building first visit to CIA headquarters on Saturday into an airing of grievances about “dishonest” journalists, while wildly overstating the size of the crowd that gathered on the National Mall as he took the oath of office. Trump said throngs “went all the way back to the Washington monument,” despite photos and live video showing the crowd stopping well short of the landmark. Trump’s visit took place as throngs of women, many of them wearing bright pink, pointy-eared hats, descended on the nation’s capital and other cities around the world for marches organized to push back against the new president. Hundreds of protesters lined the motorcade route as Trump sped back to the White House, many screaming and chanting at the president. The Washington rally alone attracted more than 500,000 people by the unofficial estimate of city officials. It appeared to be more people than attended Trump’s inauguration on Friday, but there were no comparable numbers. The city did not release an estimate for the inauguration. The National Park Service does not provide crowd counts. Suggestions of weak enthusiasm for his inauguration clearly irked the new president. Shortly after his remarks, Trump dispatched Spicer to aggressively reinforce the message. “There’s been a lot of talk in the media about holding Donald Trump accountable. And I’m here to tell you that it goes two ways. We’re going to hold the press accountable as well,” Spicer said in his first appearance in the White House briefing room.